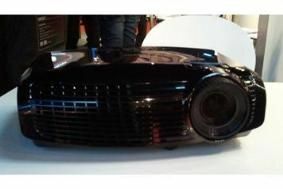 ISE 2011: Optoma makes 3D projection affordable | What Hi-Fi? The projector specialist's stand at ISE in Amsterdam features the GT720, a ‘3D ready' projector with short-throw lens, a weight of just 2.3kg, and a price tag of a mere £600. Of course, it's (slightly) too good to be true. The ‘ready' part of ‘3D ready' means you'll have to spend another £250 or so on the 3D XL, a box that converts the signal from your 3D sources (Blu-ray, PS3, Sky and so on) into the ‘frame-sequential' standard projectors require. That £250 includes a pair of active-shutter 3D glasses, and additional pairs are £99 a pop. Optoma will be showing the GT720 at the Sound and Vision Show in Bristol between February 25th and 27th.